So I am currently in Mauritania and still making daily cards. 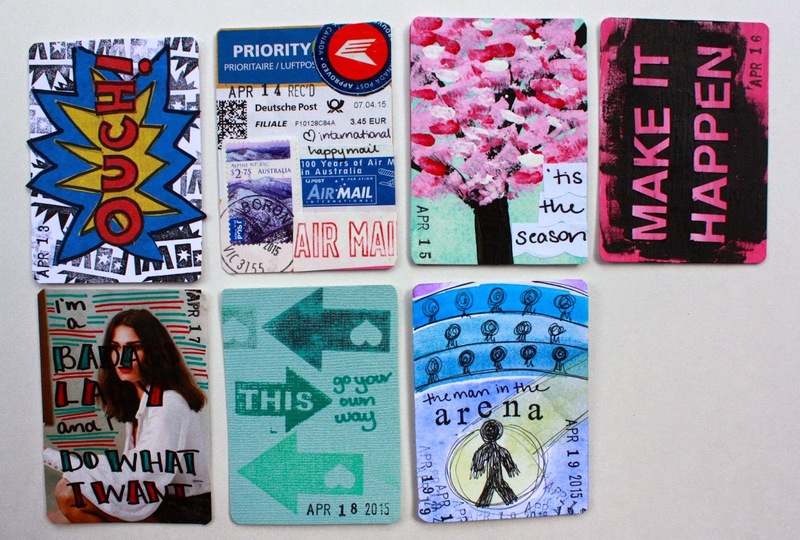 But because my card-posting schedule is behind my card-making schedule, these are from a couple weeks before I left. The "Ouch!" card is the fruit of messing up my back. I don't know exactly why it started - it hurt after I ran five miles on Saturday and so, like a totally sane person making good choices about her body, I ran another five miles on Sunday and it hurt after that too. (#humblebrag) I went to Bar Method the next morning and felt okay, but after I got out of the shower it hurt so badly that just blow-drying my hair made me wince in pain. So listen to your body was a major lesson learned that week. I made the card at the end of my sick day, inspired by pain and by Daredevil on Netflix. A couple Sundays ago, my parents took us to see a play about Justice Scalia at the Arena Theater (only in DC, right?) The play starts with the actor walking out on stage humming along to an opera and, since I wasn't yet immersed in the story, the flicker of a thought crossed my mind that he looked silly. And then immediately after I admired the bravery and vulnerability of risking looking silly in front of a packed house. I realized he was Teddy Roosevelt's, and more recently Brene Brown's, man in the arena. For this card, I thought about using stamps or basically anything that would let me avoid freehand drawing, but decided that sketching - loosely, imperfectly, even a bit cartoonishly - was the best way to get the idea across. Made me think about what I can do to spend more time "in the arena" myself.